By Richard W. Goulding, F.S.A. Librarian to His Grace the Duke of Portland, K.G. "No single virtue we could most commend. That, as no one prevail'd, so all was she." Dryden. PLATE I. LADY HENRIETTA HARLEY, afterwards Countess of Oxford. By Sir Godfrey Kneller, 1716. (Welbeck Abbey Pictures, no. 454. Lady Henrietta Cavendish Holles, 1694-1713. Lady Henrietta Cavendish Harley, 1713-1724. Henrietta Countess of Oxford, 1724-1755. 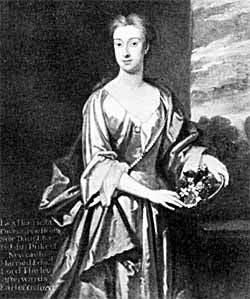 LADY Henrietta Cavendish Holles was born on the 11th February, 1694,1 and was the only child of John Holles, Duke of Newcastle-on-Tyne, and his wife Lady Margaret Cavendish, daughter of Henry Cavendish, second Duke of Newcastle-on-Tyne (of the first creation). Her father was the son of Gilbert Holles, third Earl of Clare, and he succeeded to that earldom in 1689. In 1694, he was advanced to the titles of Marquess of Clare and Duke of Newcastle, and in 1698, he was elected a Knight of the Garter. In 1705, he was constituted Keeper of the Privy Seal and, according to Bishop Burnet, he exercised "great caution and exactness" in the discharge of his duties. He appears to have been an ambitious, proud, reserved man, of cold and autocratic temperament. He rarely indulged his wife with any expressions of affection or endearment, and when he conveyed his wishes to her, he made it plain that they were commands to be obeyed. He considered his wife Peevish, a verdict that is not inconsistent with her aspect as depicted in Miniature no. 167 in the Welbeck Abbey Collection; though another Miniature of her, no. 177 in the Collection, painted by H. Byrne (or Burne) in 1678, is much more pleasing in expression, and represents her so attractively that it is easy to believe that her father had good reason for calling her (as he did) "my joy and my jewel." If she had a tendency to peevishness, that tendency was not likely to be allayed by the curt and inconsiderate way in which her husband addressed her. It is clear that he was an exacting man, and in February, 1699, he complainingly writes: "Your sentences are so imperfect, I believe you did not read over what you writ this post." On the 1st May, 1701, he says: "There are six shillings charged here for oranges and lemons. So I desire you to send me word what use you sent for 'em for." PLATE II. JOHN HOLLES, DUKE OF NEWCASTLE, K.G. By L. Cross. (Welbeck Abbey Miniatures, no. 166.). LADY MARGARET CAVENDISH, wife of John Holles, Duke of Newcastle. On the 13th of the same month, his ill-humour appears again: "To shew you I am better natured than you are, I write and send you the prints, tho' your letter is fill'd with mistakes." And on the 15th, in answer to a remonstrance, he rejoins: "For all you are so peevish, I have bin at home this week before it was dark." He signs many of his brusque communications: "Faithfully yours." It appears that he omitted to ask his Chaplain to say grace, and when the latter gently suggested that he should not be overlooked, the Duke incontinently answered: "If you cannot take your salary without disturbing the family, leave it. "2 The Duke died at his seat at Welbeck Abbey, 15th July, 1711, in consequence of a fall from his horse when he was stag-hunting in Sherwood Forest two days previously. The atmosphere of the home of the child Henrietta was one of repression and formality, and she regarded her parents as persons of whom to stand in awe. 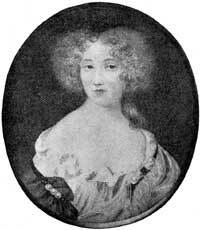 She developed a consciousness that she was the daughter, the grand-daughter and the great-grand-daughter of Dukes, and a certain primness of thought and ceremoniousness of demeanour3 that she retained to the end of her life; but withal she had in abundant measure the graces of amiability, considerateness and sincerity that made her generally beloved. Of her childhood we know little, but in all probability it was a serious, rather than a joyous time, and the books that were placed in her hands were well calculated to oppress, and not to delight a maiden of tender years. When she was twelve years old, for instance, her mother gave to her "The Causes of the Decay of Christian Piety, by the Author of the Whole Duty of Man;" and when she was fourteen, her mother gave to her a formidable folio, Parr's "Life of Archbishop Usher," containing many letters in the Latin tongue! She probably found more amusement in gifts that were made to her by her father's friend, M. Crowe, who was Governor of Barbadoes, and who (2nd March, 1708-9) sent to her two Parakeets, two Land Turtles and a Jackawiney,4 which he described as a diminutive lion not bigger than, and as tame as, a young rabbit. In the preceding August, Mrs. Crowe had sent to her a fine Macaw. It was known that she would be a great heiress, and suitors were not backward in making matrimonial overtures. The child was only nine years of age when, in December, 1703, the Intendant of the Court of a Count of the Holy Roman Empire, to whom he refers as Count de N., wrote to the Duke of Newcastle, proposing an alliance between his master and the Duke's daughter. He said that his master was favoured by his birth, his nature, his accomplishments and his fortune, that he had not completed his thirtieth (!) year, and that he was so much in earnest in his wishes to win the young lady's hand that he was prepared to become a naturalized Englishman, and to spend his revenues in this country. In June, 1706, one Jacob Bonnell proposed to the Duke to contract his young daughter to the Elector of Hanover's son,5 and he did not doubt of being capable so to manage the affair that till it should be matured it would be a secret from all the world except the Duke and himself. These two proposals were turned down. 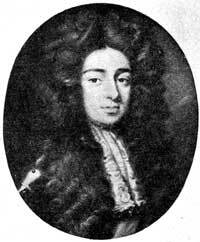 In March, 1707, a third suitor was introduced, the Duke of Somerset making an offer of his son, Lord Hertford. To him the Duke of Newcastle made answer that his daughter was not woman enough. His Grace of Somerset was a patient man, and allowed four years to pass by. He then, in February, 1711, renewed his offer, but failed to bring about the result he desired. About two years before this date, namely in April, 1709, Henry D'Avenant wrote from Francfort to the Duke of Newcastle, suggesting Count Nassau as a suitable son-in-law. He described him as about twenty-four years old, extremely handsome, very finely bred, of a very good understanding, given to no excess, very prudent in the conduct of his private affairs, and having the principles of a man of honour. All these commendations were in vain. The Duke resolved that his daughter should not marry a foreigner, and that her husband should be an Englishman whom he could thoroughly approve. His approval was not given to Lord Danby,6 whose grandfather, Thomas Osborne, first Duke of Leeds, made a proposal on his behalf. The proposal of the aged nobleman was firmly rejected, but the young man's father, Lord Carmarthen, was not inclined to accept the rebuff, and was suspected of "a design to seize and carry away Lady Harriot by force." Writing to the Earl of Oxford about the Duke of Leeds, 10th September, 1711, the Duchess of Newcastle says that he "has a perticular mallis to mee from our often rejecting his impertinence in his proposalls; it was his mad son my Dear Lord suspected had a desine to use vialence on our Dear Child." An account of the negotiations that preceded the marriage of Lord Oxford's own son and the Duke's daughter was penned by Auditor Edward Harley (Lord Oxford's brother). He states that early in 1711, when the Duke of Newcastle heard that steps were being taken to arrange a marriage between Edward Harley, son of Robert Harley (who in May of that year was created Earl of Oxford) and "the only daughter of a very rich citizen," he suggested to the Auditor, who was the intermediary in the affair, that he should not proceed further in it, as his brother might "marry his son much better than to any citizen's daughter! "7 After the Duke's death in July, 1711, the Harleys did not let the matter drop, but pressed it with the Duchess of Newcastle, who at first was very favourably inclined to the match, and desired Lord Oxford to secure the title of Duke of Newcastle. Doubtless this promotion in the peerage would have gratified Lord Oxford,8 and he thought it not impossible of attainment, for he answered (8th September, 1711): "I doubt not the Queen will have regard to Your Grace's desire." However, in the following year, when he gave to her some unpalatable advice in connection with legal proceedings then depending with regard to the settlement of the Cavendish and Holles estates, she was so exasperated with him that she entirely changed her mind about the match, and did all she could to prevent it. Her protests and her prohibitions were in vain, for the young people were well pleased with each other, and, despite her mother's anger and opposition, Lady Henrietta decided to follow her own inclinations. (1) This appears from a letter written by Dr. William Stratford to Lord Harley, 12 February, 1715, the day after the birth of his daughter Peggy. Stratford says: "It is very remarkable that the child should come upon the day the mother was at age." This letter, and most of the others cited in the course of this paper, are preserved in the Library at Welbeck Abbey. For permission to use them, as well as for permission to reproduce the portraits that illustrate the paper, I tender my sincere thanks to the Duke of Portland. (2) Anecdote recorded by the second Earl of Oxford. (3) Mrs. Delany, when staying at Bulstrode (the Duke of Portland's seat), wrote to Mrs. Dewes, 30 November, 1743: "We were afraid Lady O. would have come, and her formality would not by any means have agreed with the liberty of this constitution." (4) Mr. C. Davies Sherborn suggests that this animal was a species of the genus Capromys. The Camb. Nat. Hist., x. 490, states that this genus is restricted to the islands of Cuba and Jamaica. (5) Afterwards King George II. (6) This Lord Danby died 16 August, 1711: it is curious that his younger brother, who in 1712 became Marquess of Carmarthen, married Lord Oxford's daughter Elizabeth, 16 December, 1712. (7) Dr. William Stratford, in a letter to Lord Harley, 16 June, 1711, mentions a report that Lord Oxford had mortgaged his estate to the Duke of Newcastle, and designed to make amends to Lord Harley by marrying him to the Duke's daughter. (8) After the marriage had taken place, rumour credited Lord Oxford with attempting to induce Queen Anne to confer the title of Duke of Newcastle upon his son Lord Harley.